NEW for 2015! 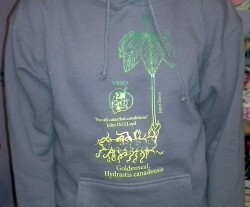 This endgangered herb VBMA Hooded Sweat shirt has the VBMA logo in the middle in conjuction with a gorgeous rendering of Golden Seal a green to yellow gradient. Thanks to Joyce Harman and her artistic friends for the design! Available in Small, Medium, Large and Extra Large.